Often cited as one of the most important works of Old English literature, Beowulf is a great way to introduce students to epic poetry. 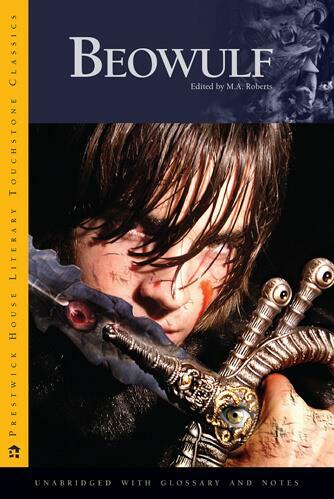 There are many translations of Beowulf to choose from, including our Literary Touchstone Classics edition. Prose translations may work best if you have limited time, but more advanced high school students can study poetic translations, which will better demonstrate the meter of the original piece. The original Beowulf manuscript is estimated to have been written between 975 and 1025 CE. Before starting Beowulf, you can show students how the English language has changed over the centuries by reading passages from Old, Middle, and early Modern English. In addition, a lesson on Germanic and Scandinavian history, Scandinavian legends, and Christian elements in Beowulf will help students contextualize the poem. Your class can also discuss the definition of a hero or good leader versus that of a monster. They can relate these qualities to contemporary heroes, leaders, and “monsters.” This discussion will show students that, even though the culture in Beowulf seems far removed from modern times, the poem explores universal themes that are still relevant today. Keep reading to learn more about this legendary story! Beowulf, a heroic warrior of the Geats, helps the Danish king Hrothgar, whose great hall is frequently attacked by a monster called Grendel. Beowulf slays Grendel with his bare hands, but the following night, Grendel’s mother seeks revenge. Hrothgar, Beowulf, and their men track Grendel’s mother to a pond, and Beowulf dives into the underwater lair and kills Grendel’s mother with a sword. The hero returns home and becomes king of the Geats. Fifty years later, a dragon terrorizes the Geats. Beowulf tells his warriors that he must fight the beast alone. He defeats the monster but is mortally wounded in the process. The Geats hold a funeral and mourn him. Content Warning: Beowulf contains violence. Recognize the elements of an epic poem in Beowulf. Identify characteristics of Germanic culture as depicted in Beowulf, including the commonality of feuds, the importance of weapons, and the attitudes toward life, death, and material possessions. Discuss the relevance of women’s roles in Germanic culture. Clarify the relevance of the anecdotes that interrupt the main story. Explain the Germanic heroic code and how its values differ between warrior and king. Identify the key characteristics that make Beowulf an epic hero. Good vs. Evil — Beowulf features a battle between a courageous, loyal warrior and evil monsters that threaten the humans. Family and Community — In Beowulf, ancestry and tribal relations determine people’s identities; those without tribes are seen as incomplete. Altruism vs. Egotism — Warriors and kings share values of loyalty, courage, and selflessness. However, a good king has a greater duty to his people, while warriors pursue personal glory.